While the trip to München was long, the 6 halls filled with new and exciting robotics applications was absolutely worth it. In a day I was able to visit the 3 halls most relevant to Accerion and met many inspiring people showcasing their companies. These halls were filled with robot arms, AGV, inspection equipment, large manufacturing setups and much more. The use of vision with robotic arms seemed to be driving a lot of clever solutions. One impressive solution was picking and placing rusty metal parts from a pile in a box, using 3D vision. The range of innovative mobile solutions for manufacturing automation was amazing. In the attached picture I’ve included a few. 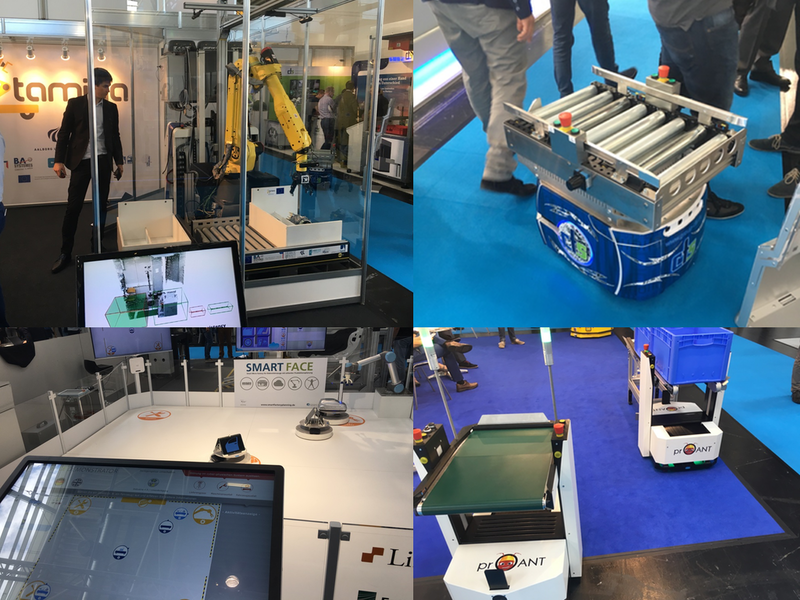 There were a few clever small logistics AGV, enabling automation from a small scale in a factory. A research project by BA Systems et al for the PSA group enabled parts picking from a warehouse for automotive manufacturing, bringing the right parts to the right car on the production line. One project even aims to build a self-organising manufacturing plant using artificial intelligence. Next Automatica München will be in 2 years, and I’m sure it will be worth the wait.